Welcome to the M0VRR Web Site. 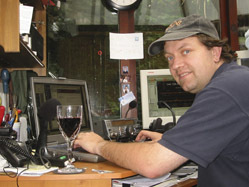 Hi my name is Vaughan Ravenscroft and I operate the amateur radio station M0VRR. I first became interested in radio about the age of 7 when my Dad give me a multi band radio receiver. I would spend hours sitting in the garden listening to the Air and short wave bands. Then around the age of 12 "Santa-Claus" gave me a CB Radio, this was great I made lots of friends over the air and even meet a few at "eyeballs". As I got older my school work started to take up more of my time, and as I developed an interest in computers the CB got used less and less. It was through my interest in computers that I meet my computer studies teacher " Mr. Stan Sharred", who was and still is a radio amateur G4JGV. He told me a little about amateur radio and that you could speak to people all over the world. After leaving school I still didn't get into amateur radio although I did buy myself an AOR1500ex scanner and on and off for many years became a SWL (Short Wave Listener) listening to the air (and other) bands. In 1999 remembering what Stan had told me I decided to find out about becoming a radio amateur. I was put in touch with the Local Radio Club as they ran the RAE (Radio Amateurs Examination) course. In December 1999 and with the help of Martin G8VXX, Ray G0XAT and a few others I took the RAE. In the following January was notified that I had passed with a credit. I received my first class B call sign M1EOQ in the February of 2000. 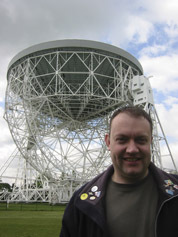 January 2002 the new foundation licence was introduced, this gave limited access to the HF bands. As a class B licence holder all I need to do was take a morse assessment. So with the help of Lee G0MTN I passed the morse assessment and held the call sign M3ANB. In July 2003 after the WRC03 (World Radiocommunication Conference 2003) the morse requirement for a Full (Class A) license was removed, this gave me the opportunity to apply for the call sign M0VRR. After leaving school I got an apprenticeship with a local electronics company repairing electronic equipment from Television, Computer, FAX machines, to PCB's (Printed Circuit Boards) from industrial and medical fields. I worked my way to the position of Workshop manager before leaving to start my own business. I moved into the communication industry some time later working with the local Cable Company (Birmingham Cable). Birmingham Cable merged with Telewest another UK Cable Company in 1998. In 2005 Telewest merged with NTL and later the NTL:Telewest company merged with Virgin Mobile before rebranding as Virgin Media February 2007. I worked in operations management designing and building business information and reporting systems, and I currently manage a team of people for Virgin Media's Technology Discovery Dept. My own business interests have continued with Intermip.NET Ltd providing web-hosting and IT support for businesses and individuals.